Inside the Vehicle Assembly Building, the external fuel tank for the STS-121 space shuttle mission is hoisted into position for attachment with the twin solid rocket boosters atop a mobile launch platform. The tank, ET-119, will carry the liquid oxygen and liquid hydrogen to feed Discovery's three main engines during launch. In preparation for space shuttle Discovery's departure from its Orbiter Processing Facility hangar for rollover to the Vehicle Assembly Building and mating with the tank and boosters, the ship's 60-foot long payload bay doors are swung shut. Take a virtual ride aboard the Russian Progress 21P cargo freighter as it docks with the International Space Station. This movie captures the final approach and successful linkup from a camera on the Progress craft's nose. Taking advantage of the high sensitivity of ESA's XMM-Newton and the sharp vision of NASA's Chandra X-Ray space observatories, astronomers have studied the behaviour of massive fossil galaxy clusters, trying to find out how they find the time to form. Many galaxies reside in galaxy groups, where they experience close encounters with their neighbours and interact gravitationally with the dark matter - mass which permeates the whole intergalactic space but is not directly visible because it doesn't emit radiation. These interactions cause large galaxies to spiral slowly towards the centre of the group, where they can merge to form a single giant central galaxy, which progressively swallows all its neighbours. If this process runs to completion, and no new galaxies fall into the group, then the result is an object dubbed a 'fossil group', in which almost all the stars are collected into a single giant galaxy, which sits at the centre of a group-sized dark matter halo. The presence of this halo can be inferred from the presence of extensive hot gas, which fills the gravitational potential wells of many groups and emits X-rays. A group of international astronomers studied in detail the physical features of the most massive and hot known fossil group, with the main aim to solve a puzzle and understand the formation of massive fossils. In fact, according to simple theoretical models, they simply could not have formed in the time available to them! The fossil group investigated, called 'RX J1416.4+2315', is dominated by a single elliptical galaxy located one and a half thousand million light years away from us, and it is 500 thousand million times more luminous than the Sun. The XMM-Newton and Chandra X-ray observations, combined with optical and infrared analyses, revealed that group sits within a hot gas halo extending over three million light years and heated to a temperature of 50 million degrees, mainly due to shock heating as a result of gravitational collapse. Such a high temperature, about as twice as the previously estimated values, is usually characteristic of galaxy clusters. Another interesting feature of the whole cluster system is its large mass, reaching over 300 trillion solar masses. Only about two percent of it in the form of stars in galaxies, and 15 percent in the form of hot gas emitting X-rays. The major contributor to the mass of the system is the invisible dark matter, which gravitationally binds the other components. According to calculations, a fossil cluster as massive as RX J1416.4+2315 would have not had the time to form during the whole age of the universe. The key process in the formation of such fossil groups is the process known as 'dynamical friction', whereby a large galaxy loses its orbital energy to the surrounding dark matter. This process is less effective when galaxies are moving more quickly, which they do in massive 'clusters' of galaxies. This, in principle, sets an upper limit to the size and mass of fossil groups. The exact limits are, however, still unknown since the geometry and mass distribution of groups may differ from that assumed in simple theoretical models. "Simple models to describe the dynamical friction assume that the merging galaxies move along circular orbits around the centre of the cluster mass", says Habib Khosroshahi from the University of Birmingham (UK), first author of the results. "Instead, if we assume that galaxies fall towards the centre of the developing cluster in an asymmetric way, such as along a filament, the dynamic friction and so the cluster formation process may occur in a shorter time scale," he continues. Such a hypothesis is supported by the highly elongated X-ray emission we observed in RX J1416.4+2315, to sustain the idea of a collapse along a dominant filament." The optical brightness of the central dominant galaxy in this fossil is similar to that of brightest galaxies in large clusters (called 'BCGs'). According to the astronomers, this implies that such galaxies could have originated in fossil groups around which the cluster builds up later. This offers an alternative mechanism for the formation of BCGs compared to the existing scenarios in which BCGs form within clusters during or after the cluster collapse. "The study of massive fossil groups such as RX J1416.4+2315 is important to test our understanding of the formation of structure in the universe," adds Khosroshahi. "Cosmological simulations are underway which attempt to reproduce the properties we observe, in order to understand how these extreme systems develop," he concludes. The XMM-Newton observations of the fossil galaxy cluster RX J1416.4+2315 were performed in July 2003. Chandra's observations of the same object where made in September 2001. The findings will appear in the Monthly Notices of the Royal Astronomical Society (astro-ph/0603606). 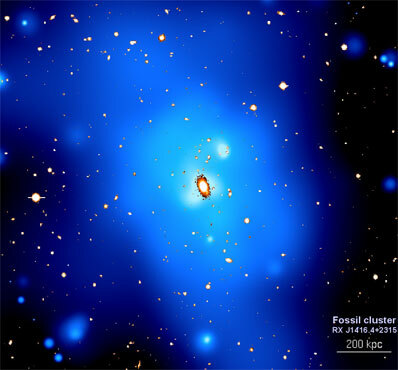 The article, titled "A fossil galaxy cluster; an X-ray and optical study of RX J1416.4+2315", is by Habib G. Khosroshahi, Trevor J. Ponman and Laurence R. Jones (School of Physics and Astronomy, The University of Birmingham, UK), Ben J. Maughan (� Harvard-Smithsonian Center for Astrophysics, Cambridge, MA, USA).